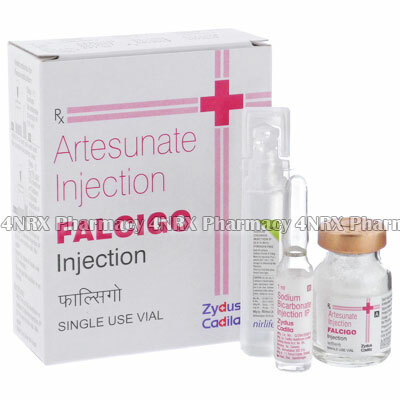 What is Falcigo Injection (Artesunate) used for? Falcigo (Artesunate) is a World Helath Organization approved antimalarial agentfor use as a first-line treatment in cases of severe malaria. Each package contains 60mg of Artesunate powder and the required sodium bicarbonate and sodim chloride solutions for mixing the powder. How should I use Falcigo Injection (Artesunate)? Artesunate powder is designed to by dissolved with sodium bicarbonate and sodium chloride and injected intramuscularly or intervenously. Mix immediately before injecting and discard any unused ingredients. A loading dose of 2mg/kg, followed by a second dose of 1mg/kg in one hour and a third dose of 1mg/kg after 24 hours is generally advised. Follow the dosage instructions as provided by your doctor. What are the side effects of Falcigo Injection (Artesunate)? Artesunate causes very few if any side effects in most patients when taken at the recommended dosages. Higher dosages can sometimes result in cardiotoxicity. It is also possible that you will display signs and symptoms of fever when taking Artesunate. Tell your doctor if you are pregnant before taking Artesunate. Artesunate is still the favoured treatment during the second and third trimesters, however the safety of taking Artesunate during the first trimester of pregnancy has not been established.